There was a new Mainstreet poll last week. The numbers are all within the margins of error of the previous one. Hardly shocking since nothing really happened in between. The problem? It's pretty much guaranteed this poll can't be right. Or, more specifically, there is almost no chance in hell the BC Conservative will indeed receive 11% of the vote. This is pretty remarkable for a party that, for all intents and purposes, doesn't exist, to be able to poll in the double digits! But it won't be the case on May 9th. As a side note, it's also well possible the Green Party is currently overestimated. But we can give them the benefit of the doubt for now. So, what can we do? Well, past electoral results show that BC isn't the most volatile province. Or at least hasn't been since 2005. I mean, just look at the result of the BC Liberals (the party that has been in power literally the entire 21st century) from 2005 to 2013: 45.8%, 45.8% and 44.13%! The past might not be predictive of the future, but you'll allow me to be skeptical when I see polls putting the BC Lib at 35% or lower (like last week). The pre-election polls in 2013 also had this party really low and we all know what happened at the end. Another indication that the BC Liberals are currently underestimated is the clear overestimation of the BC Conservatives. With that said, the Mainstreet poll is somewhat surprisingly showing that most BC Conservative voters currently have the Green and NDP as second choice - only 19% have the Liberals. My own analysis from the past results does agree that it'd be a mistake to assume BC Cons voters can only switch to the Liberals. For instance, one region where the BC Conservative party increased the most last election was Vancouver Island. Granted it was essentially because they ran candidates where they had none in 2009, but it does show that the fertile grounds for the BC Cons is not necessarily where we think. Also, the numbers mentioned above are after redistributing the 23% of undecided (so among decided and leaning voters). Before redistribution, the BC Lib are at 27% and the NDP at 32%. Assuming the undecided won't chose a "small" party, and also assuming a slight advantage for the incumbent (typical in Canada really - so a 60-40 split in favour of the Liberals), it gives us 41% for the party of Christy Clark and also 41% for the party of John Horgan, while the Green would be at 10 and the Conservative at 8%. The BC prediction market has the following numbers: BC Lib at 41.2%, BC NDP at 41.3%, BC Green at 10.7% and the BC Cons at 5.7%. I have to say, these numbers look pretty much what I would expect (that's assuming the BC Cons will manage to run candidates in at least half the ridings though). The market gives the Liberals over 55% chance of winning a majority and only 40% to the NDP while I respectively have 47% and 44%. I also have 3% chances of a Liberals minority, the same for a BC NDP minority and finally a 3% chance for a tie. We see a very close race. 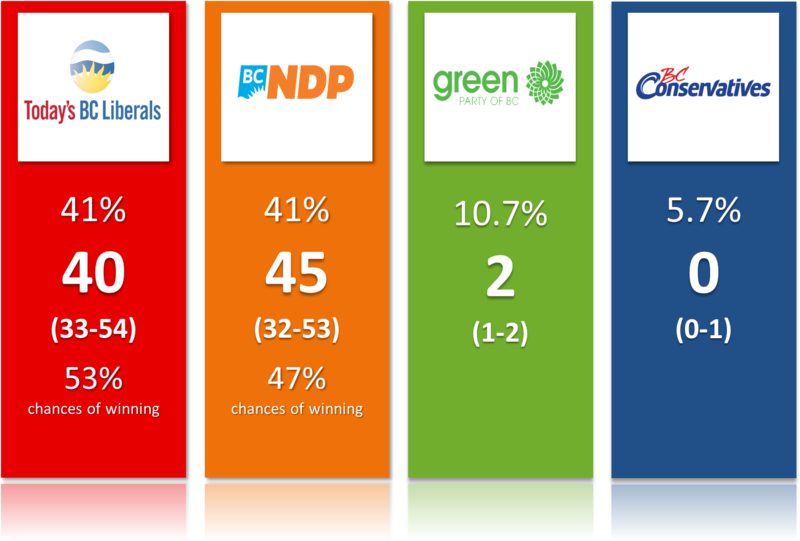 However, if we consider a tie as a Liberal victory (technically Christy Clark would be asked first to form a government -she'll actually be asked even if she loses but let's forget that for a moment), then Clark's long range chances of keeping her job are 53% (this is what you see on the graphic above). The model is somehow giving higher chances to the Liberals despite projecting them with fewer seats. That's a weird occurrence but far from impossible. It arises mostly for two reasons. First of all, we have the possible ties as explained above. Secondly, the seat distributions aren't always absolutely symmetrical. You can see the phenomenon with the confidence intervals: the BC Liberals' possible seat distribution is slightly to the right of the BC NDP's one. Also, and this might be more important, these long range projections have the BC Conservative too low to be a threat anywhere. On the other hand, the BC Green would be in the race in up to four ridings. And if Andrew Weaver and his party were to win these ridings, that would hurt the NDP more because those are NDP seats. Let me put that slightly differently. If we account for the uncertainty that exists, the BC NDP is slightly more at risk of a better-than-expected showing of the Green party. And in a tight race where every seat counts -and where the NDP might have to actually win more seats since a tie wouldn't be good enough, that is enough to give the Liberals a slight edge. However, if the numbers above were to actually happen on election night (i.e: the BC Green would not outperform the polls and indeed only get 10.7% of the vote), then John Horgan would likely become Premier. If we use a more qualitative/subjective approach, there are other reasons to expect a close race. The Liberals have the economy going for them along with public finances. For many people, life has been good in BC during the 21st century and they might not want to take a chance. On the other hand, after 16 years in power, many people are probably ready for a change. Plus Clark is very unpopular. In terms of policies, the Liberals will mention all the measures about real estate (I'm not going to debate whether they will work or not), a hot topic in BC. People seem to have responded favorably to those. As for the NDP, two key proposals (minimum wage at $15 and $10 daycare) also appear to be popular (if we believe Mainstreet's numbers). - At this point, a reasonable long range forecast for the BC election would see the main two parties pretty much tied around 40-41% with the BC Conservative significantly lower than the current poll numbers. - This would create an incredibly tight race. In particular, it doesn't seem that any party holds a serious electoral advantage with the electoral map or the vote efficiency (i.e: winning more seats with fewer votes). It would instead come down to a couple of key races (17 ridings projected to be close -within 5%- out of 87). - The BC NDP is more at risk because if the BC Green party was to out perform the polls, they'd likely take seats away from the NDP, not the Liberals. - If we forget about ties being technically a win for the incumbent, the race is as close to 50-50 as it gets. In conclusion, at this point in time, it appears likely that the 2017 BC election will be a close race. We are still far from the election and obviously many things can happen, but this is the best we can do at this point. And I truly believe that those are better projections than if we were to simply take the current polls at face value. Here below is a picture with the projections and probabilities based on the numbers mentioned above.